​Noyes’ founding in 1893 and significant role in the early life of a Washington D.C. suburb gives a unique view into small-town life from the turn of the 19th century through the 1950’s. Noyes’ story also chronicles the path of the public library system in the Washington D.C area, mirroring ​the growth of libraries throughout the U.S. The many obstacles Noyes has overcome in surviving its various incarnations is a fairy tale of committed leaders, volunteers and patrons who have held on to the vision of a community-based library and ​literacy center for young children, and who have made that vision a continued reality. 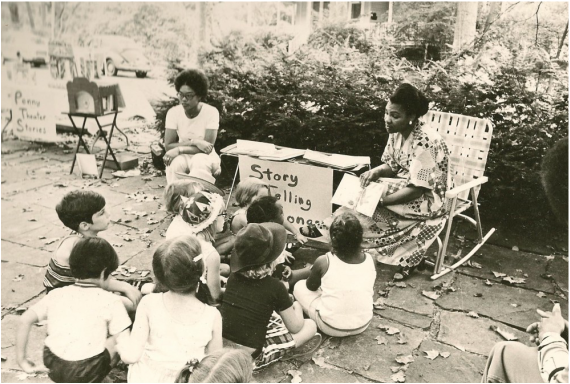 Interested in the movement for public libraries, Crosby Noyes and Brainard Warner founded the Noyes Library as a neighborhood library for the citizens of the new town of Kensington. It opened on January 10, 1893. A real estate broker and banker, Warner chose and donated the land and built the library while Noyes, who was the editor and publisher of the newspaper Washington Evening Star, filled the library with books, many of which he had reviewed for his paper. The Noyes Library Association was formed to run the Library. Its mission was to "equip and maintain a public library and reading room in Kensington for the moral, intellectual and scientific improvement of the surrounding community". To become a member of the Association, one had to be 16 years or older, of good moral character, live in Montgomery County and pay an annual fee of one dollar. The reading room was free. Books could be checked out for a monthly fee of ten cents. An unattributed newspaper article from 1894 talked of some community events held to raise funds for Noyes such as "'phonograph entertainment', lawn parties, and 'book evenings' with candy sales." At Crosby Noyes' death, his will "provided annual subsidies toward the support of the library and provided a trust fund for the purpose". In the early years, expenses for the Library included coal for heating, oil and other supplies for the lamp lighting; stationery products; furnishings; and employee salaries. In 1893, librarian salaries were $5.00 per month. 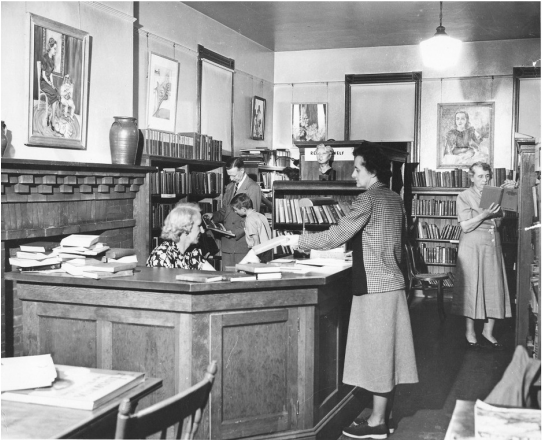 ​By 1936, librarians were receiving $15.00 a month. Members of the Kensington Women's Club assisted the librarians by volunteering. ​THE LIBRARY BEGAN WITH APPROXIMATELY 600 BOOKS DONATED BY CROSBY NOYES; THROUGH GRADUAL PURCHASES AND DONATIONS, IT HAD APPROXIMATELY 2,000 VOLUMES BY 1895. INITIALLY, NOYES AND WARNER CONTRIBUTED ANNUAL SUBSIDIES AND CONTINUED DONATING BOOKS. IN ADDITION, THE LIBRARY RELIED ON COMMUNITY FUNDRAISING EVENTS AND SUPPORT FROM LOCAL WOMEN'S CLUBS. ​From the start, the Noyes Library was the social and intellectual center of Kensington life. School children would use the library's resources for their schoolwork; adults also of course benefitted from its book holdings. 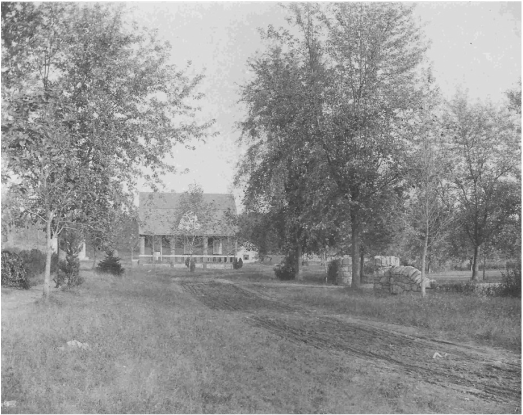 Noyes was a social gathering place for the community. The building was used for Town meetings where community decisions were debated. The Presbyterian Church also met at Noyes before its members had their own building. The Library records document the history of Kensington's families of the time. As each person got their library card, their name and the month in which they acquired it was registered. These were grouped by family with husband, wife, children and grandchildren listed together. In addition, the library records show the arrivals and departures of ministers and the community's churches. ​The Library continued operating in this way until the early 1950's. In July 1950, the Town of Kensington agreed to support the Library with free services to Kensington residents and subscriptions of $2.00 for those out of town. The Town also hired a full-time librarian. The following year, small local libraries were given the choice to join the newly formed Montgomery County Department of Public Libraries or to remain independent. Association decided to transition from a community library under a private board of trustees, to become one of nine libraries that joined to create the Montgomery County Public Library system in 1951.The agreement with the county stipulated that Noyes' books and library services would remain located within the corporate limits of the Town of Kensington. If the terms of this agreement were not complied with, the county would have to reconvey the land and improvements back to the Noyes Library Association. Despite this agreement, the Noyes Library's book collection was subsequently merged with the Garrett Park adult collection and the Rocking Horse branch collection, and the Noyes building was closed in the late 1960's. Before its closing, Noyes was open from 1 a.m. to 9 p.m. on weekdays and 9 a.m. to 5 p.m. on Saturday. ﻿As a result of the community's unhappiness with Noyes' closing, there were many protests and civic efforts to re-open it. These efforts led to a grand outside-the-box idea that celebrated Noyes' unique features while serving a very special group of patrons. In short, Noyes re-opened in 1972 as the Noyes Children's Library. Noyes is the only library in Montgomery County, and one of only about eight in the U.S., that focuses solely on children. As a children's library, its mission was to develop child-focused programs that could be used in other county library children's rooms, to work regularly with special needs children, to reach out to children who cannot easily attend the usual library branch programs, and to work with groups of parents and other adults involved in services to children. ​The library provided an extensive collection of books for children from ages birth through elementary school, plus a parent-teacher collection. Another legacy of this era of Noyes is Penny Theater, a story-telling tradition based on English miniature "penny theaters". Noyes librarians and volunteers created magical sets depicting favorite children's books and performed to rapt audiences throughout the county library system and beyond. Also in 1970, the Maryland-National Capital Park and Planning Commission (M-NCPPC) designated Noyes Library a historical site. The Library re-opened with new hours: weekdays from 1 a.m. to 5:30 p.m., and Saturday from 9 a.m. to 1 p.m.
Noyes' existence was once again threatened in 1991 as a county budget crisis brought significant cutbacks in county funds. The Noyes Children's Library was scheduled to be closed as part of budget cutbacks. In response, county residents - including supporters from Kensington, Silver Spring, Wheaton, Bethesda, Chevy Chase, Potomac, and Rockville - came together and vowed to keep the landmark open to benefit future generations. Supporters formed a public-private partnership with the Montgomery County Council to continue Noyes' operations. During the 1991 crisis, the County Council agreed to provide $50,000 if the private sources would provide the remainder of the Library's operating budget. ​In less than 6 months, the private partnership incorporated as the non-profit Noyes Children's Library Foundation and raised over $60,000. Through personal donations and fundraising events, the Foundation enabled Noyes Children's Library to stay open and available to the community's children. 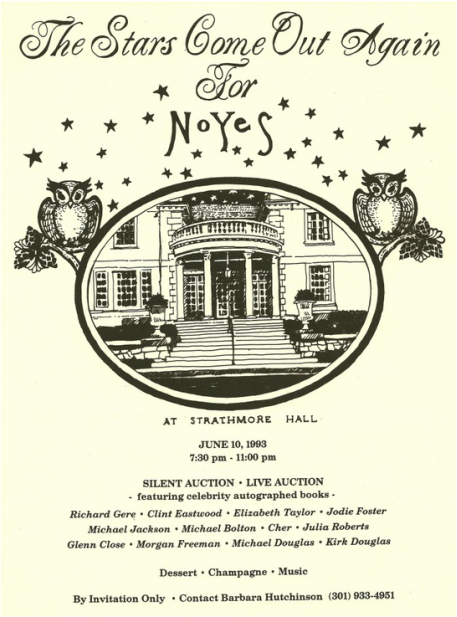 Notable among the fundraising events was "The Stars Come Out For Noyes" Gala, for which dozens of Hollywood stars autographed and donated their favorite children's books, which were auctioned off.Now on to the next chapter - making MORE Noyes, making Noyes accessible to all, and making it a true center for early literacy training and outreach! Read more about the Make MORE Noyes Renovation Campaign HERE. ​Located in historic Kensington on a triangular plot of land, Noyes has been a library since its construction. Across the street lies Warner Mansion, the home Brainard Warner built to launch the new suburb of Kensington. The Mansion property is now a Montgomery County Park. A rectangular building, the Library has a gambrel roof and two louvers at each end that allow air to run through the attic. Noyes Library's most distinctive feature is the NoYes sign on the front pediment in which the "Y" is capitalized. This has intrigued children for years since it appears to say ​"No Yes". Above the NoYes sign is an owl, which represents wisdom and learning, an appropriate symbol for a library. In 2015 a naming contest was held and patrons voted to name the owl "Pearl." The owl motif has led to many owl-themed gifts for the Library.